The Ceremonial Start of the Iditarod took place today, and Jan Steves took off with bib #40 at 11:23 a.m. for her third year in a row in this grueling competition. Her daughter Nicolina was there to represent our whole family and cheer her on. I’m sure that for Jan, this time is as exciting as the first, and for Nikki, it must be so overwhelming to see her mom take off on a 1000-mile adventure in the pursuit of her passion–dog mushing. I’m no expert on this sport and am continually amazed by Jan’s commitment to it. While I may never feel the urge to participate in this activity, I am certainly in awe of those who train diligently, take loving care of their dogs, and brave the elements to compete in this amazing race. And I’m also fascinated by the avid followers of the sport. In 2012, I flew up to Anchorage to support Jan and to witness the Ceremonial Start in Anchorage for my first time. Devotees of the Iditarod flocked that winter wonderland, decked out in furry jackets armed with souvenir programs to be signed by their favorite mushers. 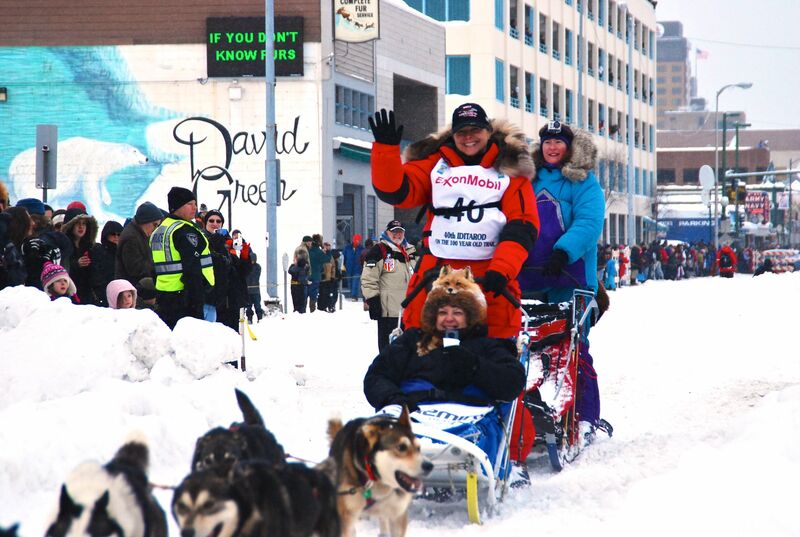 Read all about my trip to the 2012 Iditarod here to learn all about the Ceremonial Start and the amazing Jan Steves. And be sure to follow her progress and see the current standings on the official Iditarod website.